BioEYES Australia is an award-winning, innovative, hands-on approach to teaching primary and secondary students about science. Since it began, BioEYES Australia has reached more than 10,000 students with some 83% of students stating they can imagine themselves as scientists after completing the program. How does it work? Over the course of a week, students nurture the development of zebrafish embryos, observing the transparent eggs (Danio rerio) change from a single-celled zygote to a free swimming larvae. 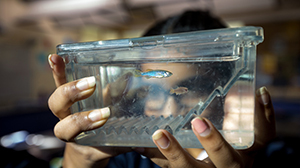 Students develop their critical thinking skills and perform collaborative experiments as they study the lifespan and development of the zebrafish, anatomy and genetics. The entire program is run at schools, making it accessible to students and their teachers. See BioEYES in action in the classroom and hear Dr Jamie Shuda, Director of Life Science Outreach at UPA, explain how the program works. Our team consists of both doctoral trained research scientists and VIT certified school teachers. This places us in a unique position to provide a program which introduces students to passionate scientists while aligning the learning of the program with a number of areas from the National Curriculum. BioEYES Australia is run through the Monash Biomedicine Discovery Institute (Monash BDI) and the Australian Regenerative Medicine Institute (ARMI) at Monash University. With more than 130 internationally-renowned research teams between them, these institutes are at the forefront of medical research, working on global health priorities. We are prioritising increasing the reach of our programs to regional and under-represented schools. BioEYES was created in the USA in 2002. More than 50,000 students in America have been involved in BioEYES since its inception. In 2010 ARMI introduced the BioEYES program to Australia in partnership with the University of Pennsylvania Institute for Regenerative Medicine (IRM). 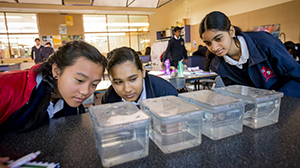 A pilot program ran during National Science Week with year 10 students at the John Monash Science School and year 4 students from Bentleigh West Primary School. During the pilot, more than 200 students were involved. The pilots were taught by Jamie Shuda, one of the creators of BioEYES and Director of Life Science Outreach at the UPenn IRM. To ensure the long-term potential for the program, Jamie also trained 40 teachers during a professional development day. Since then, more than 10,000 students and teachers in and around Melbourne have participated in the program. The program was initially funded by the Australian Government's Department of Innovation, Industry, Science and Research. It was also selected as a top six STEM outreach program in Victoria by Business Working with Education. Turning students on to science Cosmos Magazine article about BioEYES Australia. See BioEYES Australia in action in the classroom and hear Dr Sharon Flecknoe from the Monash Biomedicine Discovery Institute, explain how the program works on Channel 10's Scope. Project BioEYES: Accessible Student-Driven Science for K–12 Students and Teachers article in PLOS Biology journal about the impact of BioEYES. With demand for the BioEYES program growing, we are now seeking partnerships with industry and donors to enable us to continue to reach out to students and meet teacher demand. We strive to keep our costs as low as possible to enable all students access to the program. Consequently, we cannot recoup the complete costs of the program and rely on additional funding. We are experienced and passionate, and looking for partners. By supporting BioEYES Australia, you will be supporting continued opportunities to inspire future generations of young scientists. We encourage you to get in touch to discuss ways you may be able to support us and find out how we can work together. Demand for our program is growing with BioEYES often booked out a year in advance. Please get in touch with our Schools Outreach Coordinator to discuss possibilities for your school. See BioEYES Australia in action in the classroom and hear Dr Sharon Flecknoe from the Monash Biomedicine Discovery Institute explain how the program works on Channel 10's Scope. Reaching more than 2,000 students each year, this program books out quickly. Contact Laura.Reid@monash.edu if you would like to discuss having BioEYES at your school. Help us continue to inspire the future generations of young scientists. Hear what our teachers and students have to say about the BioEYES program and read some of our media coverage.